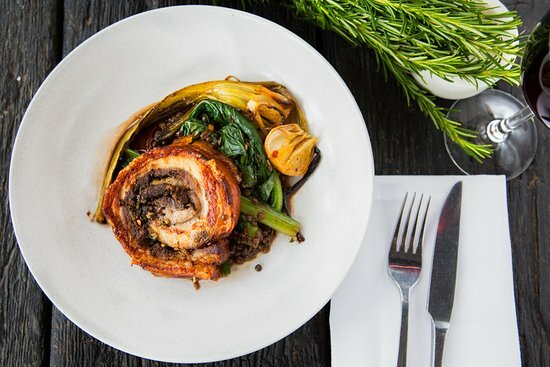 Rather than resting on their laurels and bathing in Fitzrovia’s success over the past few years, the owner’s have just opened The Roxborough on Acland St. The name: a homage to Jonny Roxburgh. Not the guy from Jackass, rather the London restauranteur of The Admirable Crichton fame, caterer to the stars and mentor to Paul Jewson (Fitzrovia’s Executive Chef/owner). Roxburgh was hugely influential in Jewson’s 20-year career in the UK, and now honoured with a shrine down-under. The venue is unrecognisable from the previous tenancy, a decaying Spanish restaurant. The decor is a clean cut, two-toned rehash of the St Kilda Army & Navy Club. A classic 1920s art deco building, with original ornate empire style friezes and stucco plasterwork, white terrazzo, limed American oak and white tile details. It’s slick as a prize calamari, without having the sterilised sheen of an operating theatre. You’d easily picture it on a Mediterranean waterfront; the Balearic charm of Palma or Ibiza Town, but here the double fronted windows open into Acland Street, with the bustling foot traffic. It’s not so much an oasis, as a quaint vantage point to watch the surrounding mayhem. The menu sprawls from small ditties to big band mains – lunch, dinner and mid-afternoon grazing. Stylistically it’s Mediterranean, with the occasional exploration. The Grilled Lakes Entrance octopus leg was meaty, muscular, yet tender, with a sideshow of charred bullhorn peppers and persillade, all laying seductively in a moat of saffron aioli. 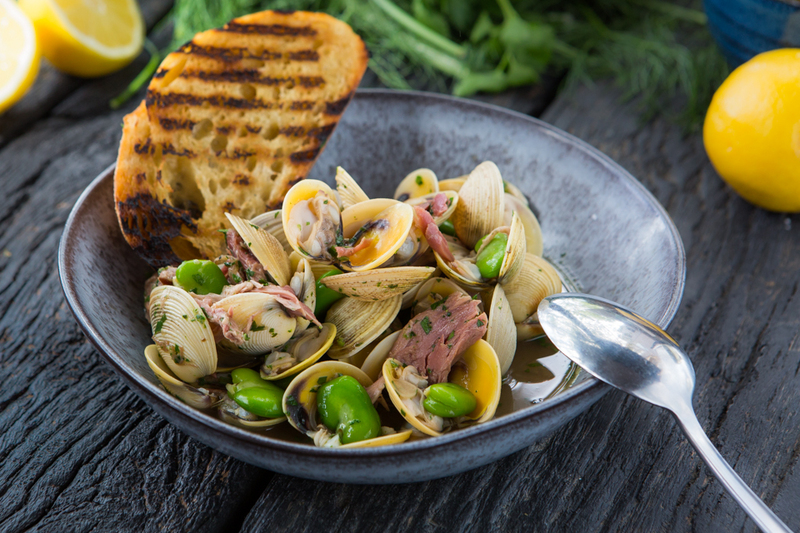 Pippies and clams, pork hock, broad beans and parsley – a very bold dish that doesn’t so much as tiptoe around the palette, as instigate a fully fledged bar brawl. Ingenious combinations of colour, texture and smokiness. An incoming St Kilda staple. La Porchetta – how to explain this dish of rare breed rolled pork belly (see picture)? A large pig lollipop doesn’t do it justice… Let’s go with an intricately texturised pork belly spiral, unravelling from a spicy inner circle, to an outer casing of perfect crackling. Clever stuff. Fine art on a plate. Of the desserts, the pine nut, pear and almond frangipane tart with mascarpone stood out. They’ve bravely pulled away from using too much sugar, allowing the nuts and pear to blossom. Desserts are all too often a rowdy bombardment of sweetness, monopolising every other ingredient. Here’s an example of expert refrain, a wink rather than a headbutt, luring you in for more, like Miles Davis teasing the audience with a distant hook. The Roxborough makes food that reverberates after the meal, by that I don’t mean indigestion, rather that your appreciation builds in its afterglow, similar to a thought-provoking film, a culinary Aronofsky or Nolan. Indeed, there’s a lot to comprehend; deep plot lines and ingenious multilayering. Best off revisiting this one, frequently.